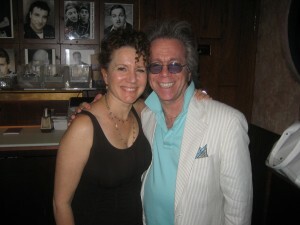 Jeffrey Gurian of Comedy Matters TV with Susie Essman at The Comic Strip! 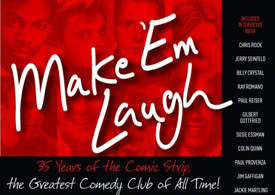 I have the exact details of that story in the interview I did with Susie for the book I’m writing on the history of the legendary comedy club “The Comic Strip”, a club where she performed in her early days, but I’d have to look it up and I’m too lazy! 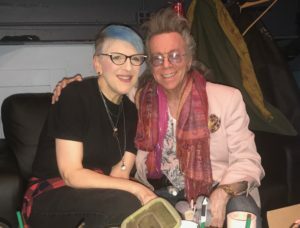 I’m proud to say that Susie and I are friends for many years! 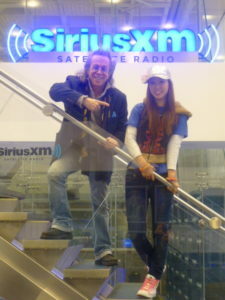 We often joke that she and I have more photos together than she and her husband! 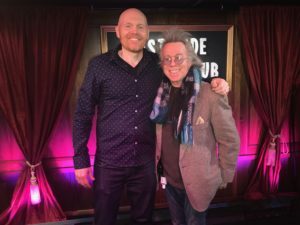 Jeffrey Gurian, Susie Essman, and Richie Tienken owner and founder of The Comic Strip after Susie's interview for the book on the 35 year history of The Strip! I’m very happy for her that she and Jimmy Harder, a commercial real estate broker got married back in 2008. 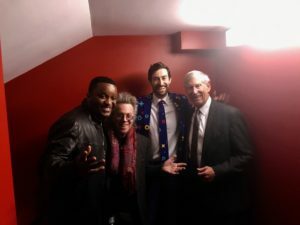 They got married at The Friars Club, and multiple Emmy-award winning writer/producer Tom Fontana who is one of the most talented and prolific TV writer/producers in the business, and who also happens to be a minister, officiated at the ceremony. Among other things, he wrote and produced such groundbreaking TV series as “Oz”, “St. 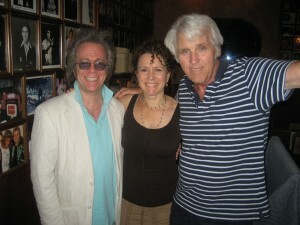 Elsewhere”, and “Homicide: Life On The Street.” Tom is also an old friend, and was the Vice Pres. of the Writers Guild East where at least one of the photos below was taken! 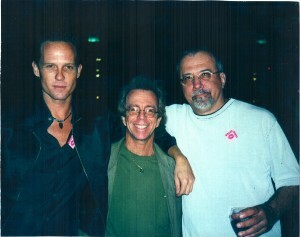 Dean Winters, Jeffrey Gurian, and Tom Fontana at a party in NYC! 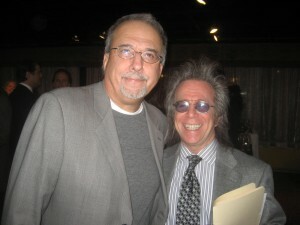 Jeffrey Gurian with Tom Fontana at the Writer's Guild Awards! Susie’s TV husband Jeff Greene is played by the hysterically funny Jeff Garlin! 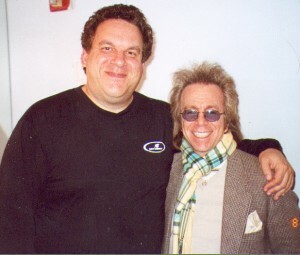 Jeffrey Gurian backstage at Carolines with Jeff Garlin from HBO's hot series, "Curb Your Enthusiasm." I actually knew Susie’s Dad Leonard, who was a wonderful physician. He was an internist, ( which you would think all doctors were, since most of our organs are internal, right? LOL ), and he was partners with a doctor I went to. Once when my doctor was away, Susie’s Dad treated me, but in those days, I didn’t realize he was Susie’s Dad. He taught me something I never forgot. I had a pain in the back of my head, down into my neck, that wouldn’t go away, and he took his thumb and pressed really hard on something in the back of my head that made me see stars, but the pain went away. I have used that technique ever since! 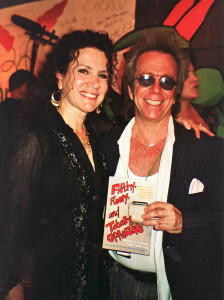 Jeffrey Gurian with Susie Essman in Montreal at the Just for Laughs Festival posing with his book that she is in called "Filthy, Funny, and Totally Offensive." 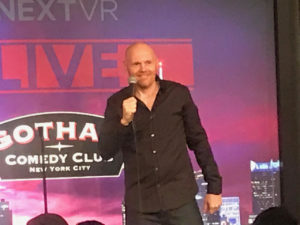 Once when Susie was appearing at Carolines Comedy Club, she came down with some sort of eye infection and was afraid she’d have to cancel her gig. I wrote her a prescription for antibiotics, and according to her I saved the day, cause her eye cleared up right away and she was able to perform. How I was able to write her a prescription is a whole other story, but to keep it simple, I was and still am a doctor, and am licensed to write prescriptions! 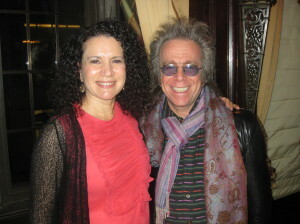 Jeffrey Gurian and Susie Essman at an event at The Friars Club in NYC! 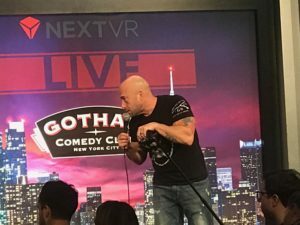 Susie will be headlining Carolines Comedy Club this coming week, and she doesn’t know it yet, but I’m planning on coming down to say “Hi!”. Please don’t tell her! I want it to be a surprise! 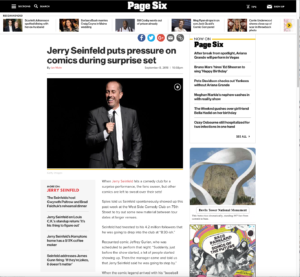 So as one of the new features of Comedy Matters I’m taking stories from Page 6 in the NY Post, the most powerful and influential page in the country, and adding some personal stories about the people I know who were mentioned on the page. 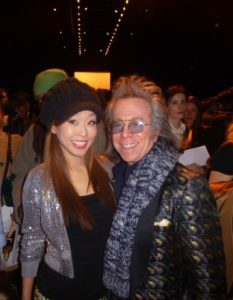 I only met Jagger once but he has a very special place in my history. First of all, as far as I’m concerned, ( and no one actually knows how far that is! ) the man is a King. To me he’s the best of the best. 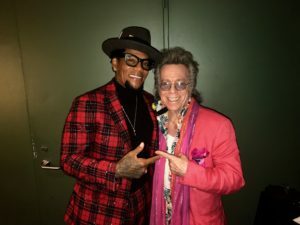 No one has ever come close and his performance at The Grammy’s this year gave me the chills cause he’s 67, and rocks out better than most musicians in their 20’s. 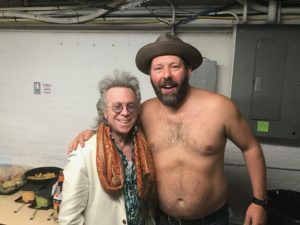 He’s thin and still has the moves that made him famous back in the 60’s. The man is AMAZING. 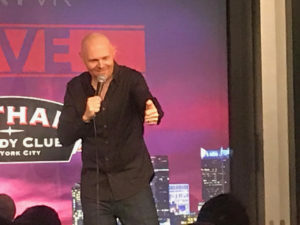 And thanks to Mick no one ever has to be old. Who ever heard of anyone being 67, and being so hip? Mick Jagger changed the world, and the world’s perception of getting old. Because if HE can do it, so can others. He’s an inspiration. As long as Mick is older than me, I can never get old. I look at him for inspiration. Now when my kids were little, ( yes, … I have kids! LOL) and we lived in a fancy neighborhood in Westchester, they used to ask me why I couldn’t be like the other Dads. 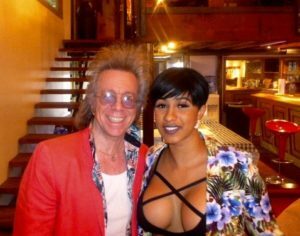 At the time, my hair was way, way below my shoulders, and I was driving a car that could only be described as a “pimp-mobile!” It was a Mandarin Orange Eldorado, with a white Cabriolet top, the big white wall tires, and I totally pimped it out with a Rolls Royce grille, just like the pimps did in the 70’s. The dealer where I bought it told me it had been made for one of the Eisley Brothers, and he decided not to take it, so I grabbed it. 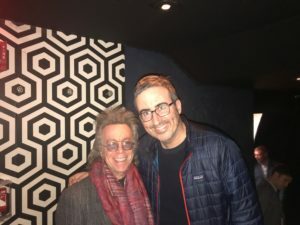 In all my years of hanging out, I was sure I’d run into Mick, but it never happened until one night at a place called Lotus. 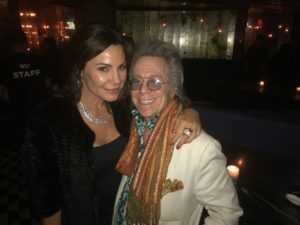 I was at a private dinner party, with an actress named Aesha Waks, and right near us, seated with Jann Wenner of Rolling Stone fame was Mick Jagger. I couldn’t believe it. He was like two tables away from me. 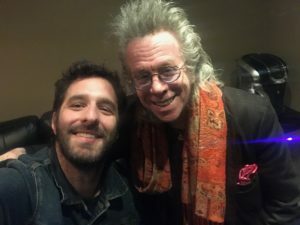 Because I was a guest at the same party I was able to walk over and introduce myself to him. 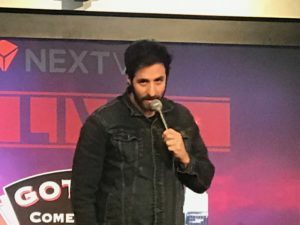 I actually told him that story about my kids, thinking that he’d think it was really funny, but to be honest, he didn’t seem that amused. And he didn’t ask me for my number so we could keep in touch! (LOL) Maybe he had other things on his mind. Perception is everything in show biz! If you like look a certain way, and carry yourself a certain way, and have a gorgeous girl with you, interesting things can happen! Unfortunately in those days I wasn’t carrying a camera the way I do now. They didn’t have small cameras in those days, and certainly not digital ones. 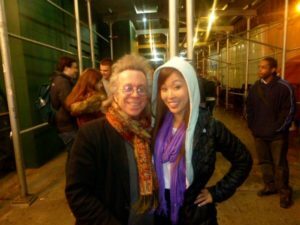 I missed getting photos with Woody Allen, Salvador Dali, The Beach Boys, and the three musical superstars mentioned above. 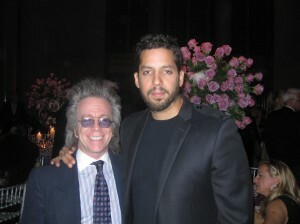 Jeffrey Gurian and David Blaine at Denise Rich's Angel Ball! David Blaine, was also in a Page 6 story the same day, about him hanging out with Ashton Kutcher, who is replacing Charlie Sheen in Two and a Half Men. 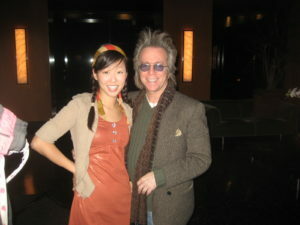 They were at a restaurant in Manhattan called Indochine. 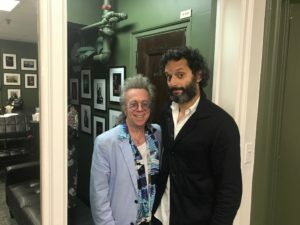 The first time I met David Blaine was also in a restaurant. 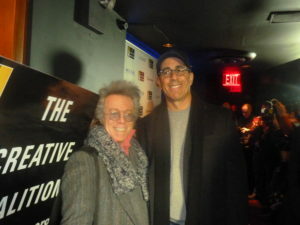 I don’t recall the name but I know it was on East 21st Street, and I was with the legendary music agent, and long time friend Jonny Podell. 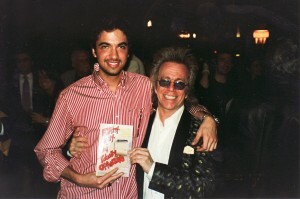 Jeffrey Gurian with Jonny Podell at The Friars Club for the book party for Jeffrey's book, " Filthy, Funny, and Totally Offensive". 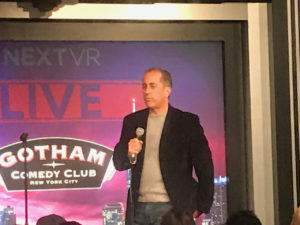 The book was based on Jeffrey's writing for the famed Friars Roasts for many years and featured the favorite nastiest jokes from over 250 celebs. 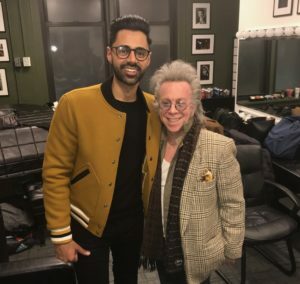 Jonny Podell is known these days as the father of DJ Cassidy who spins at every hot hip-hop party on the planet, whether it’s for Russell Simmons, Jay-Z, or Oprah! 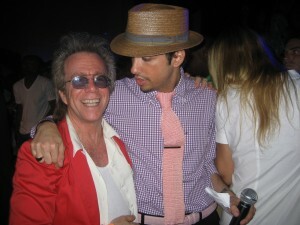 He was actually flown to South Africa to spin for one of Oprah’s New Years Eve parties a few years back. 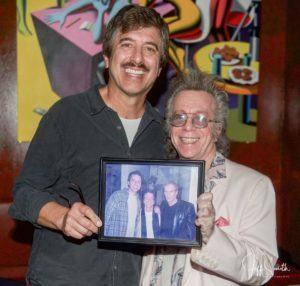 D J Cassidy looking at Jeffrey Gurian at a party in NYC, where Cassidy was spinning! 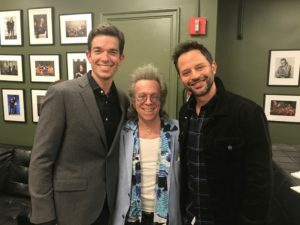 Both Jonny and Cassidy came to my sold-out totally packed, book party at The Friars Club for my book “Filthy, Funny, and Totally Offensive” and it was written up on Page 6. 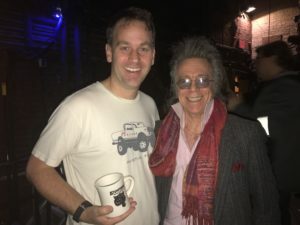 Page 6 did a great write-up about Jeffrey Gurian's book party at The Friars Club, with all the names of the celebs that attended! 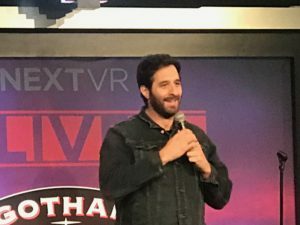 Anyway, Jonny was representing David Blaine at the time and was also like a mentor to him. 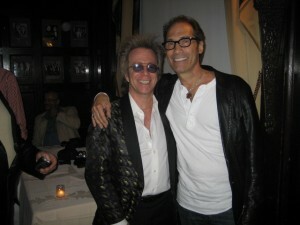 We were sitting with Alan Grubman, the famous entertainment lawyer and father of P.R. queen Lizzie Grubman. Jonny asked David to show me some card tricks and the one I remember most is where he asked me to pick a card, look at it and put it back in the deck. Then he threw the entire deck at the window of the restaurant, and the card I picked was stuck to the glass outside of the restaurant looking in at us. I never saw anything like that in my entire life. Even if he would offer to tell me how he did it, I wouldn’t want to know. I prefer to think he has magical powers! He amazed us for quite some time with many different and amazing tricks, but that’s the trick that stands out to me. 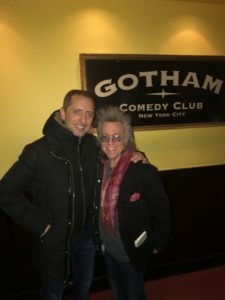 This documentary reel about me was shot as a pre-cursor to a proposed TV project that I would host, taking the viewers “behind the scenes” in the comedy world, the film world and behind the velvet ropes of New York nightlife, all places where I have strong connections. 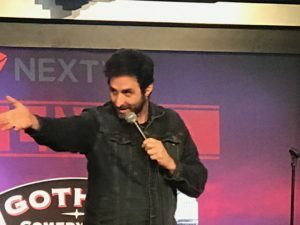 In this reel you will see great comics from late night TV like Ted Alexandro from Comedy Central, Letterman, Conan O’Brien, & Jimmy Kimmel, Jon Fisch from Last Comic Standing, VH1 and Comedy Central, Macio from The Chapelle Show, Uptown Comedy Club, & Comedy Central, Goumba Johnny, afternoon host from WKTU, 103.5 FM, film stars Marisa Tomei, Philip Seymour Hoffman, Ethan Hawke, Jason Statham, John Leguizamo, Vincent Pastore, Chris Meloni, Kal Penn, Sidney Lumet, Guy Ritchie, nightlife and TV legends Wass, Noel Ashman, and Countess LuAnn DeLesseps from Real Housewives of New York City, and Camille Grammer from Real Housewives of Beverly Hills. Please watch and feel free to leave a comment, and/or share it with your friends. Thanks!! !